Musings on Markets: Stock Buybacks: They are big, they are back and they scare some people! 1. The data regarding share buybacks does not indicate whether it is a gross or net figure. For example, many companies issuing stock options repurchase shares in the market and then deliver those shares to the person exercising an employee stock option. The net effect of this on outstanding shares is zero, but I suspect that this might show up in your data as a "share repurchase". Is that correct? By the way, if this is correct about the use of gross rather than net, it would partially explain why "share repurchases" appear to increase in the 1990's. The incidence of stock options as a form of incentive compensation increased dramatically about that time. 2. Your analysis does not appear to offer any direct help on evaluating whether share buybacks are superior to the obvious alternative. True, you initially list some differences between these alternatives, but there is little attempt at making any qualitative judgement, other than that share buybacks are pretty much a mixed bag. Further thoughts on that would be interesting. 1. The buyback is a gross figure. While option exercises may be the motive, the sheer value of the buybacks overwhelms the option exercise portion. I will try to see if I can tease out from the dat a net effect. 2. As I see it, there is little effect on the firm of a buyback vs a special dividend. The choice therefore will depend on the investors you have as a firm, and whether they like dividends or stock buybacks. That choice will be driven by cash needs and tax considerations. I think an important issue is in analysts using a constant P/E multiple. If you use a constant EV/EBITDA, you would immediately find there is no theoretical reason for a higher share price after a buyback. 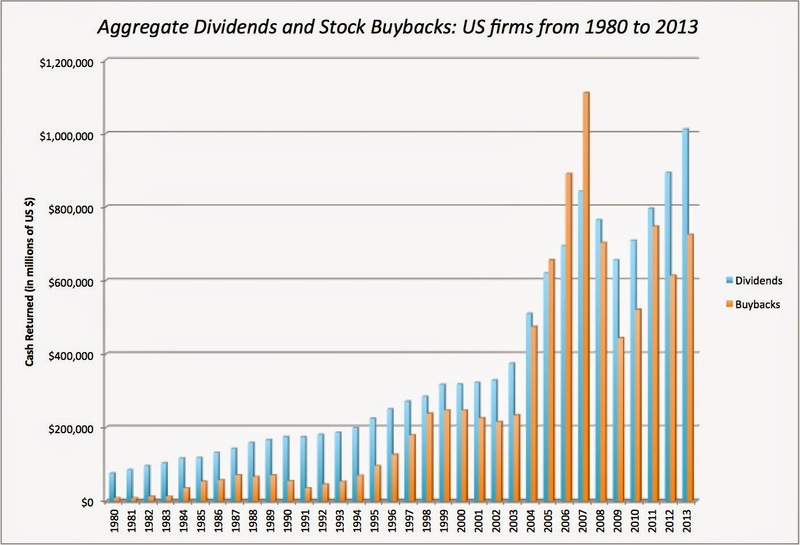 Buybacks vs dividends mainly boil down to what is price versus intrinsic value. What are your thoughts on price-to-book as an indicator of whether buying back stock makes sense? Berkshire for example uses a 120% of book value maximum threshold. Thanks for all of your posts! I don't know if it's relevant to valuation, but have you thought about writing a post on the call for universities to divest certain stock holdings from their endowments? I've read many opinions about the issue and whether or not divesting will actually have an effect on the companies "bottom line," but I would appreciate an analysis and some facts from a financial expert to help clarify this issue. @Thijs, you are correct that simple theory suggests the share price should not change when there is a buyback. But theory (and evidence) also suggest that price DOES fall when a dividend is paid. So if you return cash with buybacks instead of dividends, that effectively leads to higher share prices over time, and thus the returns to the investor come in the form of capital gains rather than dividends. The theory says nothing of the sort. In fact, I state the conditions that have to hold for a buyback to not affect price: it has be funded entirely with cash, the stock has to be correctly priced and there can be no feedback effects on reinvestment. If any of these conditions don't hold, the price will be affected. And it is obvious (and not meaningful) to state that the returns to stockholders, with buybacks, will take the form of price appreciation, not dividends. It is only if you bring investor taxes into the process that this will make a difference. When you add a constraint to an equation (as you are when you restrict investments in any sector), the best you can hope for is that you are not worse off. Any arguments that a constrained optimal is better than an unconstrained optimal are on quicksand. 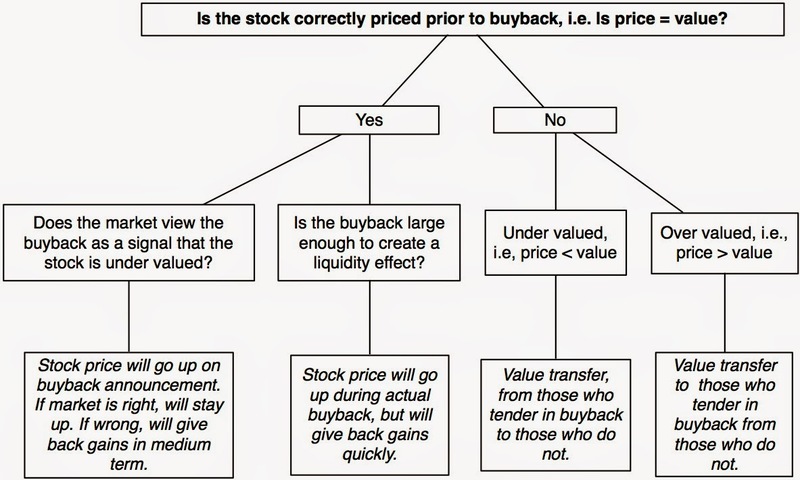 Prof, you have beautifully captured various aspects related to stock buybacks. However, I note that value of the firm increasing or decreasing based on changes to the cost of capital can be attributed not only to stock buybacks, but also to special dividends. I consider this is as a case of recapitalization process rather than stock buyback phenomena. Here buybacks are only one of the tools, special dividends being another, and borrowing more (no dividends or buybacks) is yet another. Therefore, I am not going to mention about stock buybacks funded by debt. 2) The stock price is lower than its intrinsic value. If not, why should the managers use cash (belonging to all shareholders) to give an opportunity to the tendering shareholders to transfer wealth from the remaining shareholders to themselves? Assuming that the firm does have excess cash, the value of total equity should change post buyback. 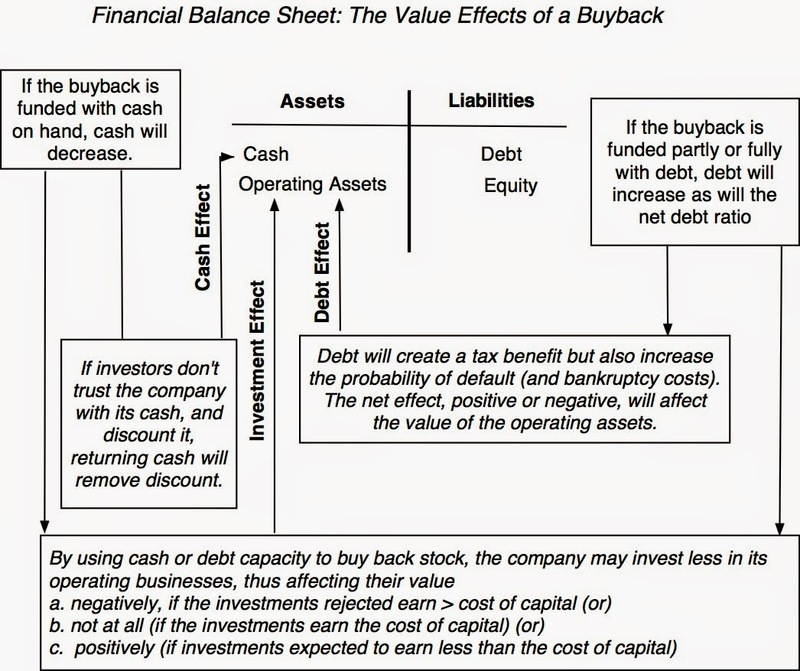 Since cash goes out of the firm, the value of total equity should reduce post buyback. Now, the wealth of the shareholders (on a per share basis) is assessed depending upon the price at which buybacks are carried out. If price paid is lower than value, the transfer of wealth is from the tendering to the remaining shareholders. But then, as you rights put they chose it. If price is more than value, it is the other way around. But then, it is poor management. If price paid is equal to value, there is no change in wealth of the either group. To do buybacks with debt is nonsense and defeats the purpose of long term value creation. This is an important topic and a well written piece. You have given short shrift to the link to exec comp - briefly mentioning it at the end. I think this deserves a deeper exploration given the short-termism prevailing in exec suites. 1. Increased leverage always look benign in good times - then turns burdensome as profit margins revert to historical levels. 2. The high level of buybacks recently has coincided with a high level of insider selling. 3. It sort of looks like managements are levering up companies ( to levels that will look dangerous in the future), cashing out and using share-buybacks to protect the share price as they cash out. In other words , sucking the enterprise dry, before they quit to "spend more time with family". Shareholders that keep their shares do not get cash, they hopefully get an increase in the value of their shares if management buys back shares for less than fair value, but that is not the same as cash. Buybacks are a return of cash to former-shareholders. "As a stockholder in any of these companies, can you honestly tell me that you would rather have had these companies reinvest back in their own businesses?.....Or that Hewlett Packard instead of paying out $60 billion to stockholders had bought three more companies like Autonomy (and written them off soon after)?" Hewlett Packard is a great example of what I mean. They did not pay out $60 billion to stockholders. They bought shares at inflated prices from exiting stockholders at the expense of current stockholders. No cash from the 60 billion went to current shareholders. I would have rather $60 billion went to existing shareholders as dividends. - I dont find that to be a convincing argument. If an exec has the opportunity to increase his net worth from $10 million to $30 million - but it would require $10 Billion of share buybacks to make it happen - why not? As long as the corporate debt markets are squacking like geese for junk bonds yielding 4% - sell as much as you can - and buyback as many shares as you can. Best to retire before the next downturn hits- when EBIT margins will probably decline from the current 14% ( large cap cos) to a more normal 6 or 7% and the increased leverage will start causing distress. This is not a very original concept. After all - the LBO/Private equity groups do much the same. Its just that perhaps in the last 3 years or so the technique has been adopted on a wider scale by public companies. "The other is that there is a tie to management compensation, where managers who are compensated with options may find it in their best interests to buy back stock rather than pay dividends; the former pushes up stock prices while the latter lowers them". Actually, perversely, in many markets such as in Australia, the payment of more dividends or a higher payout ratio would tend to push stock prices up. When buybacks are preferred over high and consistent dividend payouts, prices do not seem to be pushed up to the same degree. Your post does not seem to contest my point that buybacks are a return of cash to stockholders. What you do seem to be suggesting is that those who tender back their shares are the beneficiaries of the cash return and that those who remain get punished. I disagree with this, and the evidence on how stock prices do at companies that do buybacks backs me up, but if you do believe that non-tendering stockholders get the short end of the stick, I have a simple investment recommendation. If you own shares in a company (say Krispy Kreme) and it announces a buyback, tender your shares back and become part of the winning team (in your story). As for those long-suffering stockholders in HP, I would suggest that it is not the buybacks that sealed your fate but the fact that you chose to tie yourself to an incompetent management and an inept board of directors. Executive compensation is a big topic and deserves its own post, but here is the reason why I side swiped the issue in this post. Does the form of executive compensation affect dividend policy? Of course. If you pay managers with options, you will encourage them to buy back stock, rather than pay dividends. As a stockholder, the question is whether this hurts you. It will only if the buyback is funded with debt that the company cannot afford to carry or if it results in under investment. In my post, I argue that there is no evidence of either. So, as a stockholder, it matters little to me that executive compensation affects the form of cash return. If your point is that executive compensation is too large and too tied to equity, that is a different issue and it is tied to corporate governance. The buyback then is a symptom of a corporate governance problem and you have to deal with the problem, not the symptom. 1. I am surprised that Debt/EBITDA seems fairly stable in 2008-2009, (when earnings plunged) - according to your chart. If the data is correct, then I have to admit my concerns are probably overstated. Still, personally, I much prefer dividends. I dont like companies paying out cash disproportionately to insiders. I dont like executives overwhelmingly selling, while institutional passive money is buying. The 2008 recession was devastating for financial service firms but the earnings at other firms were not as affected. Also, I sympathize with your view about dividends, but what do insiders have to do with buybacks? Buybacks, or at least most of them, are tender offers where everyone has the option of tendering. I am not aware of any evidence that insiders are disproportionately part of the tendering group.
" where everyone has the option of tendering"
Sure, but the evidence is that insider sales are running high while institutional ownership of equities has been climbing. 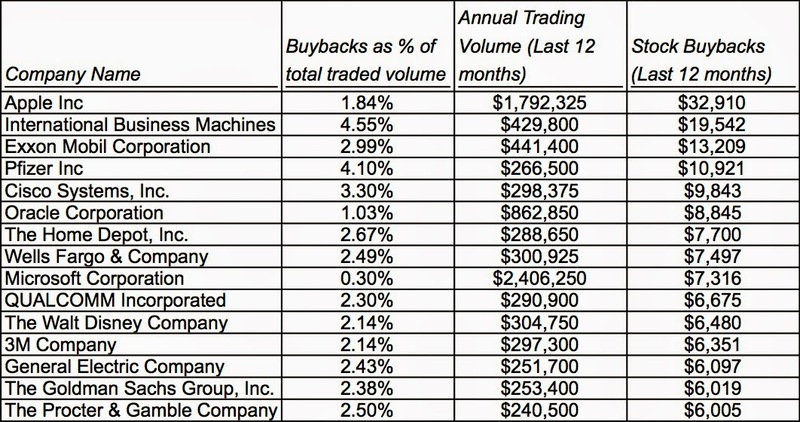 I would love to see the buyback numbers at a more granular level. Would be interesting to compare two classes of companies: a) Companies that have large exec stock programs , and b) Companies that have modest or minimal exec stock programs. That might give some clues as to the motivation behind buybacks. Also, Buybacks accelerated in 2006-2007 and then plunged. Again, accelerated in 2012-2014. It would be interesting to look over a decade or more of history to test if volume-weighted buybacks are happening at much higher than the average prices over a long period. Thank you for this clear and helpful post. What is the logic for netting buybacks against stock issuance? If stock issuance is not conditioned upon expected buybacks, and therefore present in the dividend counterfactual then it seems like a sunk cost. Thanks for your post. Share buybacks are clearly an interesting topic of debate especially amongst people looking for reasons to predict the next market meltdown. An additional confusion that sometimes arises is when people use LFCF/share projections for their DCF calculations. For the LFCF/share projections they assume that the company uses the free cash to buyback shares but do not deduct that amount from the numerator. This may seem an obvious error but I have been shocked how many times I have seen people run their analyses with LFCF/share projections assuming share buybacks but not adjusting the numerator (LFCF) for the same. 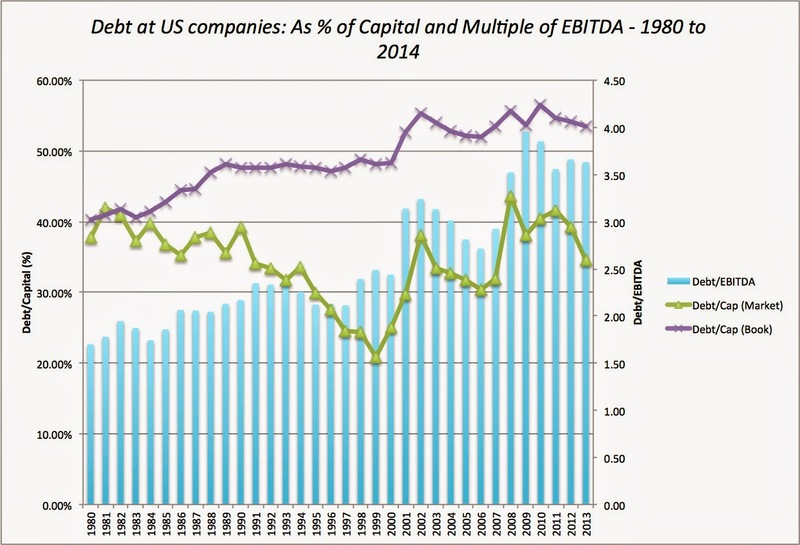 Dr. Damodaran, one quick question - in ERP calculatuion, aren't we counting the effect of share buybacks twice, once in the yield/carry and second in growth (per share growth)? Sorry, I am new to your blog and recently read you piece on ERP. Some great points from an investor's point of view. However, for the real economy I would think that when companies use a larger share of their profits on buybacks rather than investing in their business this does not bode well for the economy at large because the companies are saying: We see less business opportunities going forward, i.e. we have a negative view on our market. This can spiral into an evil cycle potentially hurting suppliers to those companies and in the end consumers as well. Excellent point about double counting and I go out of my way to avoid it. That is why I don't use analyst bottom up estimates of growth in earnings per share for individual companies and instead use growth rates in aggregate earnings in the S&P 500. You are absolutely right. 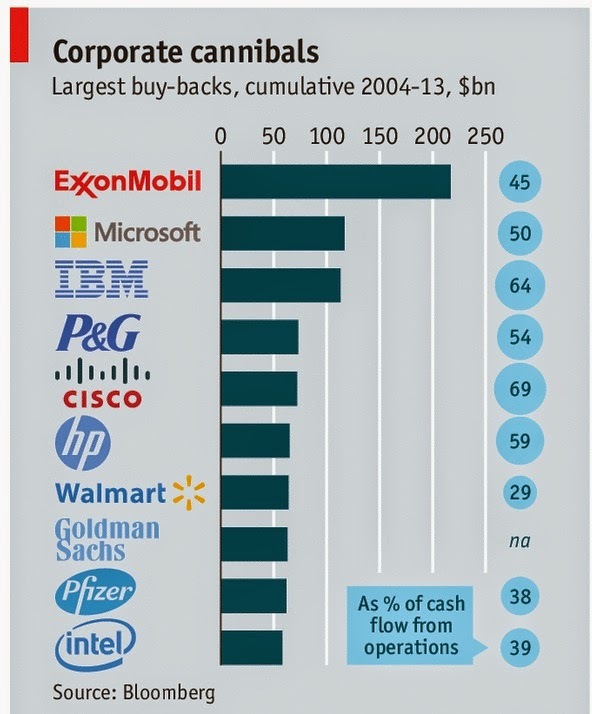 An economy where all that companies can do is buy back stock is in deep trouble, but I think may be a little extreme for the US economy, where cash from buybacks can go into new businesses (many of them in technology). collective choice disabilities of existing investors.[...] New investors are better than old ones at chiseling down agency costs" (Easterbrook'84). In other words, the market gets more information/insights about the company when it uses the new issue proceeds for the buyback. This translates into better monitoring, presumably better pricing and mitigation of agency costs. Given this hypothesis, new issue might not be a perverse buyback funding source. My question does not directly concern this blog post, but I'll post my question here anyway. I checked Your latest ERP spreadsheet for the S&P 500 index and I noticed that You have used unit adjuster for year 2012 (instead of unit adjuster for the latest period) in calculating dividends and buybacks for the trailing 12 month period. I refer to the sheet called "Buyback & Dividend computation" in the latest ERP spreadsheet. Is this just a mistake, or if it's not, what is the explanation for this? You are right. I screwed up. Fixed now. Changes ERP to 5.43%. "1. The buyback is a gross figure. While option exercises may be the motive, the sheer value of the buybacks overwhelms the option exercise portion. I will try to see if I can tease out from the dat a net effect." The number of outstanding common MSFT shares in 2010 was 8,668 billion. At end of FY 2013 it was 8.328 billion. The represents a net decrease of 340 million shares. Based on a share repurchase program authorized in late 2008, MSFT repurchased 747 million shares during that period of time. The difference between the shares repurchased and the net balance difference is thus 407 million shares. It appears that most, if not all that difference is due to various employee stock and option programs. While MFST states in its annual report that it issues "new shares" to fund their various employee stock programs, this is of no matter, because the shares are fungible. In order to understand why there has been such a large increase in share repurchases, one needs to have a thorough understanding of the role employee compensation plays here. It stands to reason that in a rising stock market (to wit, the last 5 years), one would see an increasing number of stock repurchases to fund these programs. You've indicated that "the sheer value of buybacks overwhelms the option exercise program" (which I take to mean all forms of employee stock comp), but you give no evidence for that. You may be right, but unless there is a more thorough study, I'm inclined to be more skeptical. Another indication is that in the year 2013 alone, MFST *authorized* 425 million shares under their various employee stock schemes. Another effect could be the issuance of stock to finance corporate acquisitions (allowing more favorable tax treatment to the takeover target's shareholders). Companies may wish to counteract this dilution by share repurchases (allowing those who don't mind paying tax to sell). In essence, this is an indirect way of paying cash for a corporate acquisition (Acquisition Co Shareholder A gets cash and indirectly delivers the shares to Target Company Shareholder B). In sum, there is likely a lot more going on here than companies repurchasing their own shares in order to return cash to shareholders in lieu of dividends. That's why I think it is perhaps necessary to look at *net* repurchases rather than gross repurchases as announced to the public as such. I don't quite get your point. I do look at net buybacks in this figure. That is the number that you see in the net cash yield column. It is net of the shares issued to managers. Thanks for the response. I don't recall seeing that graph in the original post. Has it been updated? And, how do you explain this response to me on that very question? If you were originally and consistently using a "net effect", there would be nothing left to "tease out". 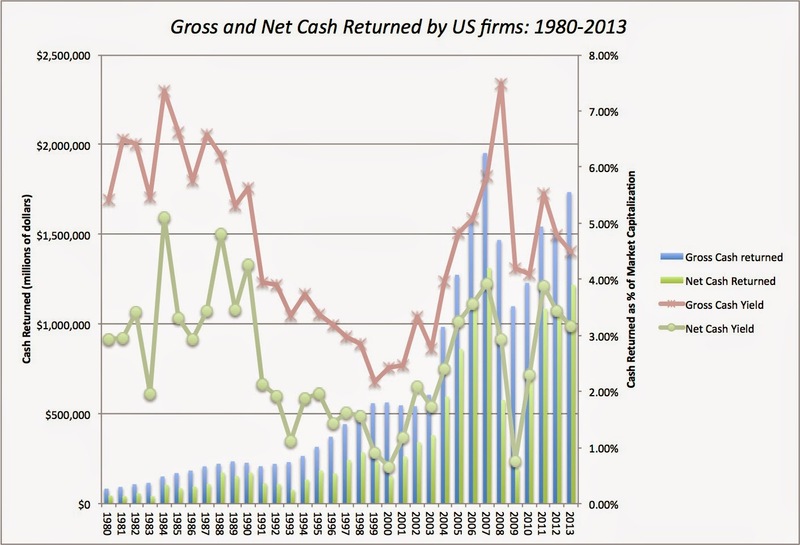 Does that net figure carry through to the other graphs on "cash returned"? It's not at all clear. This is an interesting topic for discussion. However I must say that the author's arguments lose credibility when he cannot clearly explain himself or does not accurately record changes to his narrative. First: "Your post does not seem to contest my point that buybacks are a return of cash to stockholders. What you do seem to be suggesting is that those who tender back their shares are the beneficiaries of the cash return and that those who remain get punished. I disagree with this, and the evidence on how stock prices do at companies that do buybacks backs me up, but if you do believe that non-tendering stockholders get the short end of the stick, I have a simple investment recommendation. If you own shares in a company (say Krispy Kreme) and it announces a buyback, tender your shares back and become part of the winning team (in your story). As for those long-suffering stockholders in HP, I would suggest that it is not the buybacks that sealed your fate but the fact that you chose to tie yourself to an incompetent management and an inept board of directors." This makes absolutely no sense. The (a) management team effectuated the (b) buybacks. You are saying 100% of the blame for underperformance should go to (a) and 0% of the blame should go to (b). Why? If management improperly allocated capital, one must blame both (a) the management AND (b) the method of capital allocation, aka the buyback. BTW the commenter is spot on, had HP's incompetent management merely paid the cash out as dividends, shareholders would've been better off as they would have received more value in cash than through reduction in the share count. Your response to his comment was at best poorly worded and at worst spurious. Secondly Vivian made an excellent point, namely that in modern corporate finance buybacks are used to make dilution through stock option issuance. Many contemporary commentators gloss over or are incapable of giving this subject the attention it deserves (BTW for an excellent example of this in the case of Adobe, see Michael Burry's Scion Capital letter). The way the author just glosses over and minimizes this point is highly frustrating; I would expect much more from a finance professor, with all due respect. I don't quite understand your point about buybacks being to blame for bad capital allocation. How can cash that leaves the company be blamed for bad investments made by cash that stays in the company? That would be just as absurd as saying that dividends are to blame for bad investments made by a company. I think that our disagreement is in the characterization of buybacks. You are classifying it as an investment by the company (a capital allocation) and I am arguing that it is a cash return. As for Vivian's point about compensation, I agreed with her that some of the stock issuances may have been to cover management compensation (and it is impossible to tell how much since that is not publicly disclosed) but I do report the net cash yield (net of all stock issuances). Hmm. How can a buyback be an example of bad capital allocation? Hint: does the price at which the shares are repurchased have any importance? What if Microsoft repurchases shares at $1/share? What if, instead, it pays $2000 per share? I never made the distinction of cash staying in or outside the company. My point was limited to *capital allocation* (“capital” meaning cash or other resources, and “allocation” meaning use of). “Net cash yield”? Again, that’s entirely missing the point. As long as cash paid for buybacks exceeds cash received from stock options, you’ll have a positive net cash yield. HOWEVER, this does not account for the fact that many companies dilute when compensating with stock. Some companies, like Ebay, pay billions repurchases shares (high net cash yield) yet their share count never actually decreases…almost like magic. 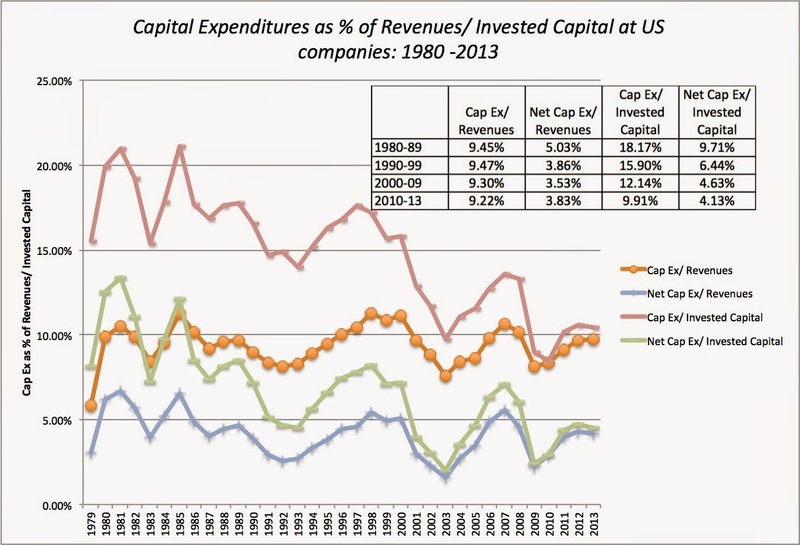 Let me clarify why a buyback is not a capital investment. Let me take your example of Microsoft, where you ask whether it makes a difference as to whether they buy back at $1 a share or $2000/share. Here is what you should do if Microsoft offers to buy its shares back at $2000. Sell your shares. That is the option you don’t have if Microsoft overpays on an acquisition or on an investment. You are not a helpless bystander in an buyback. You get to decide whether the offered price is too high or low. If you think the buyback price is too high, you can cash out and those who don’t implicitly don’t agree with you. If Microsoft tries to buy shares at $1, no one will tender. So, it will be pointless. If you are not convinced, let's agree to disagree and you should find someone who does agree with you & continue this conversation with them. And if a company issues enough shares to its employees to overwhelm its buybacks and cause dilution, its net cash yield will reflect it since stock issuances will exceed stock buybacks. Thank you for the article. I had a couple of questions/comments. 2) You note that buybacks could be have a positive, neutral or negative effect on equity valuations. Ins't a share buyback that has a neutral effect on the share price actually value destroying for shareholders due to the opportunity cost of missed dividends? 3) You list the Cap Ex/Enterprise Value of no buyback firms at 3.82%, and of buyback firms at 4.27% so how can the Cap Ex/Enterprise value of all firms be 5.53%? I can't believe I'm so late in this. I found it terrific. Just have a couple of questions: Where does the data of the last three tables regarding Capex and Debt come from? In the scenario when there partial funding of buyback with New debt, the formula only seems to consider the "cost of new debt".